Going back just a touch further in time to an issue I do remember fondly and one I still have the cover for! I always liked this cover and to me it represents a "border" issue. That is I know all of the issues after it very, very well, but many of the ones before it I only read much later. This one is not my original. I got this one in a different set of Dragons than most of the ones I am reviewing. Having the cover also means having the full-color ads. 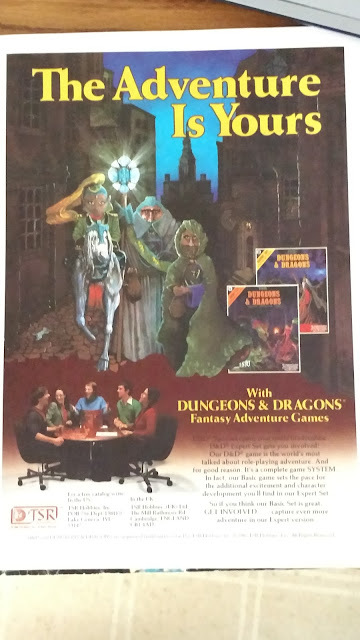 In particular is the one on the back inside cover for the MPC Advanced Dungeons & Dragons Action Scenes. Swords & Dorkery has a write-up on them and the ad that featured in this issue and in issue #67. Worth checking out! I built a lot of MPC models back then. Lots of corvettes, space-ships and at least two R2-D2s. I was never very good but I loved doing it. This issue takes us to December 1982. 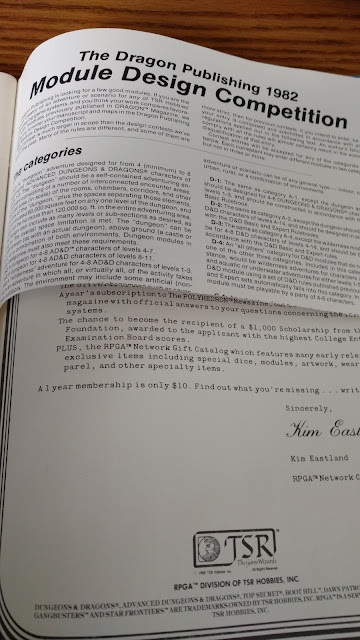 I would have been in 8th grade at this point and Basic/Expert D&D ruled my world. This issue also has more "punch per page count" than many of the other issue I have looked over recently. Lots of material I used or will use later. Even material I can still use today. Well if you like weird monsters (who doesn't really!) we have a collection of fungus monster in this month's Featured Creatures by Gary Gygax. These monsters later would appear in the Monster Manual II. There is a set of improved rules on two-weapon fighting by Roger Moore. Great artifact of its time, but have even better rules now. Arthur Collins gives a really interesting article on playing during the Ice Age. I like the idea and there are some great bits of advice here too. I think there should have been much more restrictions on the classes to be honest. Humans are still unlimited in every class. I don't have a huge issue with that, but there should be far less choice. I don't think there should be magic-users, illusionists, or really bards and assassins. The article does suggest using shamans, witch-doctors, and witches but no indication on which ones. Great ideas for a start. Sorceror's Scroll gives us a second Gygax article. This one covers a bunch of new spells that will later show up in both S4 and Unearthed Arcana. The wording is a little different than what appears in the UA, but all are here. Len Lakofa also makes an appearance with a Leomund's Tiny Hut article on the Cloistered Cleric. This is a non-adventuring cleric class. It has some interesting ideas of what to do with other clerics. In addition to this there are a lot of new Cleric spells. I had a couple Cloistered Clerics as part of the religious order I was building in my world back then. Nice to see this again. We get to the "center fold" of this magazine, the huge article on Weather in the World of Greyhawk. It is very interesting and helpful, but maybe a little overkill. There is a lot helpful tables; wind chill, temperature variations, wind speed. But 9 times out of 10 the weather that is happening is the weather I want to happen. If it is raining, it is becuase I want it to rain for plot reasons. Sure if I were doing a pure hex crawl then there is a lot of use to this. In any case the cardboard "DM's Screen" is still intact so that is nice. 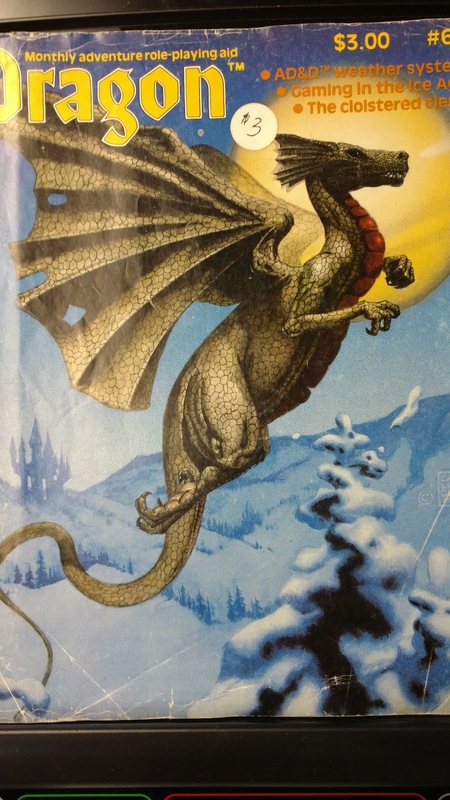 In the THIRD Gygax article we get more Deities & Demigods of the World of Greyhawk. Included are Celestian, Fharlanghn, Ehlonna, Pholtus, and Trithereon. Katherine Kerr also has an article on using ability scores as percentage system. Reminds me of what we all used to do after playing CoC and then coming back to D&D. Times your ability score by 5% to get a percentage chance of success on something. Article on a module design contest. The entry form has been removed. Guess I can't send my idea in. All in all, this is a good issue. Lots of great material and lots of useful material. I know it was a big hit for me back in 82. Want to know what I was saying about White Dwarf for the same month? Check out my White Dwarf Wednesday for issue #36.